This portal is set up to coordinate the development of lipid pathways and get together the community interested in interactive lipid pathways. Lipids serve several important biological purposes, such as providing membrane structure, and signalling. Thanks to the LIPID MAPS team for sharing their pathway knowledge through WikiPathways! Public resources for pathway information: LIPID MAPS and SwissLipids. See our Help section for New Contributor QuickStart, Editor's Palette Guide and Guidelines for Contributors. Send questions about WikiPathways to the wikipathways-discuss mailing list. The list of Featured Pathways is not static and can be updated at any time. If you know of a pathway that should be added, please contact the administrator. 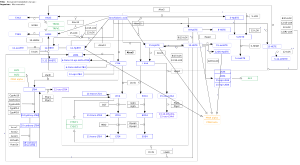 2019-01-29 - Pathway:WP4348 and Pathway:WP4349 on Eicosanoid metabolism by LOX and CYP (mouse) have been updated! 2019-01-25 - Pathway:WP4347 on Eicosanoid metabolism by COX (mouse) has been updated! 2019-01-21 - Pathway:WP4346 on Cholesterol metabolism (mouse) has been updated! 2019-01-11 - More pathways were added to the featured pathway list. 2018-10-11 - This portal was created. This page was last modified on 17 October 2018, at 17:57.